As a follow up to my post on the UK .gov blogosphere, a small session was run at the recent govcamp on the state of blogging in the public sector in the UK. The discussion was an interesting one and Al Reid took down some great notes that cover most of what was said. Pubstrat wrote a great post before the event which summed up most of the stuff we talked about anyway. Here’s my take: I was wrong to mention blogs. A lot of the resultant discussion in the comments of that post and other chats have focused on blogging, which is of course just the medium. It’s the content I am interested in. What we seem to lack is an ecosystem of ideas in public services. Discussions about new ways of doing things, how to change the way things are, how ideas get progressed into prototypes and then into actual delivered services or ways of working. Whether this happens on a blog, in a social network, on a wiki or over a cup of tea is neither here nor there. This ties in with the discussion sparked by Dom on Twitter about the lack of challenge in evidence at the govcamp, and that it was a pretty homogenous group of people in attendance. The question was posed, how do we get everyone else to these events, or at least having these sorts of conversations? The unconference format works very nicely in providing the space for people to have conversations about stuff. The blank canvas that is the agenda can be daunting, but with the right preparation, everyone can arrive at the event primed and ready to say things. I’m having chats with Jeremy and others about how this might be applied to individual organisations. Watch this space. All of this ties in with what I started to think about in several post over the last couple of months, which seems to be coalescing in my mind around the notion of learning organisations – familiar to anyone that has read the work of Peter Senge but which for me focuses on the ability for organisations to have meaningful conversations, both internally and externally, and to have a grown up attitude to change and new ideas. I’ll be talking about this on Thursday at the Cllr.10 event, with some focus on the shift in leadership that this stuff necessitates. Also worth reading around these ideas is the work Lloyd Davis is doing, as social artist in residence at the Centre for Creative Collaboration. David Wilcox has covered social artistry before too. I’m not sure we’ll ever see civil servants or local government officers with that job title anytime soon, but the skills of convening and facilitation are vital for anyone who wants to succeed within a learning organisation. The web is fundamental to the development of this thinking and the conversations around it. Firstly, because the web is the domain where the ideas are being kicked about and refined. Secondly, because these ideas are the by-products of using the web and social tools. As I keep saying these days, what makes social software interesting is not the software, but the implications of using it. Take a look at this story, excitingly titled on the BBC News site “Council Twitter users face rebuke“. The trouble is, no they’re not. It follows claims that a number of councillors used Twitter during a meeting and mocked other members. If a councillor is found to breach the code of conduct for inappropriate comments, they could be suspended. So this is about councillors saying naughty things, and not about them using Twitter, or whatever. Another example of the easy fixation on technology as being the story, when it isn’t. The story is behaviour: people and the relationships they have with others. We really don’t need anymore Twitter scare stories, it isn’t productive and it helps nobody. I had a very interesting hour today, chatting with James Brown and Dave Coplin at Microsoft. James works with the public sector all over the world, while Dave concentrates his effort on the UK. Dave also came along to last weekend’s govcamp – good man! We had a great discussion about the state of public sector IT and the big issues, like open data, innovation and collaboration in government. No one once claimed that Windows 7 was their idea. Both James and Dave are keen to be a part of the conversation and the discussion around open government and the use of technology in organisations to drive improvement and efficiency. Dave even volunteered to write something for this blog in the near future – and now I’ve written it here, it looks like he’ll have to. Thanks to Graham for putting together this Wordle produced from the text of all the tweets at Saturday’s govcamp. I like that ‘people’ is the second biggest word, and that ‘good’ is nicely central. He has also made this spreadsheet available so you can follow all the tweets from the day – it’s like you’re there all over again. you’ll need access to Google Docs to be able to see it. A quick reminder that content from the various sessions is being put together at http://ukgc.wikispaces.com/ – check to see if sessions you ran or attended have notes – if not, add them! Where next with all this? Anthony at the Democratic Society has some ideas. Update: great post from Pubstrat. 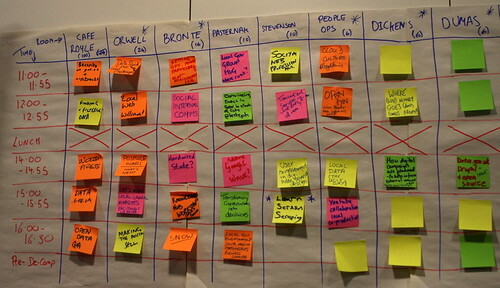 UKGovCamp as the future | The Democratic Society – "I suspect – I hope – we will look back on days like Saturday as a time of shared preparation for something much bigger: an agreeable Enlightenment salon heralding the harder, more disappointing work of social transformation. " Barnet Council FixMyStreet – Barnet Council team up with FixMyStreet – cool. Online basics – Online basics is a free, easy to use course that will help you get started using computers and the internet. CPSRenewal.ca: Column: When Social Location Sharing Meets Government Services – "Where location sharing services like Foursquare and governments collide will most likely be in the area of service delivery. More specifically, Foursquare (or whatever location sharing service rivals it) will be a key social space for any government agency that delivers service via a service center." WordPress Foundation – "The WordPress Foundation is a charitable organization founded by Matt Mullenweg to further the mission of the WordPress open source project: to democratize publishing through Open Source, GPL software." Stretching Resources 3: Using new technology | Opinion | Local Government Chronicle – "It is the right time to be thinking creatively and using modern, user-centered technology to make it possible for public sector workers to meet the demands of their jobs in as streamlined a way as possible." Lotus Knows, But Do You Know Lotus? – "Lotus is able to deliver what Google Wave fails to address: providing a solution that improves personal productivity without forcing a change in work behavior." Can We Categorize Participation and Collaboration? – "I thought it would be useful to distinguish two types of participation and two types of collaboration"
The third annual unconference, or GovCamp, for government types went pretty well. Two main factors, marvellous and generous hosting by Google, and a terrific level of participation from pretty much everyone who attended. What’s more, nearly everyone stayed til the end! Massive thanks to the other sponsors, including Huddle, Opportunity Links, Learning Pool, Boilerhouse, IDeA, Polywonk, Timetric, the Dextrous Web and probably others. Huge props too to Tim Davies and Lloyd Davis for organising the agenda setting bit of the day – it really helped everything go smoothly. Highlights for me were the sessions of getting internal communication and collaboration right – which resulted in the prospect of a spinoff event dedicated to these issues – and a session on discussing innovation in public services. sticking around the online community set up mainly for the event, but which has pretty much everyone signed up to it. Don’t forget that there is also the Teacamps – afternoon meetups in central london for government types. The next one is on the 3rd February in the cafe at the top of the House of Fraser on Victoria Street. Finally – the growing movement of ‘camps in and around government just goes to show that organising events that are useful, interesting and fun doesn’t need to be expensive or difficult. There’s nothing at all stopping you from organising your own, and there are plenty of people willing to help. The Governance Ladder « Carl’s Notepad – "The key thing for me in thinking this way is that i don’t believe that Governance should be seen as something which is rigid and fixed in an organisation. I believe that we need to start adapting our Governance to the circumstances and providing a greater level of education, awareness and information so that people (not the processes) can make better decisions in the first place." REWORK: The new business book from 37signals. – The new business book from 37signals. co-operative News – Co-ops can help transform public services – report – "The Innovation Unit, a London-based independent social enterprise dedicated to supporting the third sector, has published an independent ‘think piece’ — The Engagement Ethic — outlining the potential for co-operatives and mutuals to help transform public services. " Gov 2.0: Gov 2.0 Hero: Dominic Campbell – Much like in the US, the majority of digital engagement in the UK has been about a race to develop shiny new websites and get government agencies on Twitter and the whole spectrum of social tools. The focus has predominantly been on better PR and communications which has indeed led to some improvements, but even then nowhere near as rapidly as you might hope. NESTA Connect: The internal challenge of open innovation – "The open innovation professionals whom i've worked with who are most successful work just as hard, if not even harder, to network within their organisations to find the right people to be able to make a deal happen once they've sourced one externally. And tools like twitter are, in part, so exciting to me because they form a wonderful shortcut into organisations bypassing existing channels or opening up entirely new channels of communication that didn't exist previously. " Showing a better way – honestlyreal – "And as far as I’m aware, the fundamental problem with innovation in public services is this confusion between what constitutes ideas, and what constitutes service implementation." Backupify :: Secure Online Backup and Archiving for Gmail, Facebook, Twitter, and WordPress – "Your online accounts contain important information. Don’t risk losing any of it. Sign up for our online account backup and you will never have to worry about losing a thing." How to crowd source an IT strategy – BankerVision – "Big organisations are challenged when you ask them for quick decisions." How To Build An Online Community: The Ultimate List Of Resources – FeverBee – "This is a collection of my favourite and most popular posts from the last two years. It should give you a great overview about both the strategy any the process of creating an online community from scratch." Fabulous. Cisco’s Top 10 Predictions for 2010 – "Some leadership teams will view 2010 as an opportunity to pull ahead of their competition by investing in a collaboration architecture that will further improve their team’s productivity"
Blogging has been very light here just recently – GovCamp is basically taking over my life. Will be back on track next week, hopefully. Here’s the text of an email I sent round to members of the network last night – it’s important reading. Govcamp is this Saturday, 23rd January. I wanted to get in touch with you all to clarify the entrance arrangements. You must have a ticket via the Eventbrite system to gain entry to the event – Google are pretty tight on security, and if your name isn’t down on the list, you really won’t be allowed in. You can check to see if your name is down at http://ukgc10.eventbrite.com/ – if you are not listed there and you really think you should be, please get in touch with me by emailing d@vebrig.gs as soon as you can. For those that are coming, please arrive in time for us to kick things off at 10am. Oh, and bring a printout of your Eventbrite ticket, just in case. Departmental Dialogue Index – "This research project has identified and developed a diagnostic tool, the Departmental Dialogue Index (DDI), that will allow Departments to better understand their propensity to engage with the public." Is listening neutral? | Podnosh – "The core piece of advice for any public service on how to make good use of social media is “learn to listen”. It’s the one part of the conversation that sometimes gets lost in the rush to publish." CPSRenewal.ca: Column: Risky Business: Deputy Minister or Bust – "I cannot even recall the number of times I have been told that what I am doing on this blog, via twitter and other social media is incredibly "risky". I get the impression that many people assume that my risk tolerance is higher than the average public servant, and perhaps they are right. However if I am indeed more tolerant of risk, I would argue that it is because the way in which I frame risk is markedly different than how it is typically framed in the bureaucracy. " Government 2.0: Communication and Engagement Are On a Collision Course – "In essence, in gov 2.0 terms an effective communication strategy is likely to be almost the exact opposite of an effective engagement strategy. The former chooses and controls channels, while the latter joins somebody else’s channels The former determines rules of engagement, the latter follows somebody else’s rules. The former assumes that citizens reach out to government, the latter is based on government reaching out to communities and groups." How low is the common denominator? | Public Strategist – "Do brilliant ideas have to have polarised responses, or can they be brilliant and inclusive?" The Power of Technology to Transform Government – Steve Ballmer on Open Government: "I’m encouraged by this forum. It’s another strong signal that leaders at the very highest level of the federal government recognize that information technology has the potential to transform government by making it more efficient, more effective and more responsive." We Can Work It Out – NLGN – We argue that democratically elected councils must sit at the heart of a complex ecosystem of services and must develop their role in order to ensure greater co-ordination of support for people at the frontline. Skills quangos at the regional spatial tier should be streamlined to cut out the complexity of the current system, and local authorities must take the lead in commissioning welfare-to-work programmes from the corridors of Whitehall. Space Of Waste – Yay for govbloggers! "Hello world! My name is Lucy Toman, and I recently started working in Municipal Waste Management in Defra." Understanding participation: A literature review — Pathways Through Participation – The review brings together different bodies of literature on participation, including literature on community development, volunteering, public participation, social movements, everyday politics and ethical consumption.